Following the Freys: What is Valentines Day with out chocolate? Here in PNG Valentines Day is not the big deal that is back in the United States. In fact there really isn’t much at all that is done here. Thus if you want to give your sweetie some chocolates or flowers then you really have to plan ahead. Or in my case at least go to Lae. Lae is one of the major port cities here in PNG and also the closest large shopping area from where we live here at Ukarumpa. (Close meaning a 3 hour drive if the roads are good.) I had to go there last week for a buying trip for my department, shopping for tools, parts, and supplies. I was also learning my way around the city so that for future trips I could make the journey by myself. While I was there I also had a chance to do a little personal shopping. I knew Valentines Day was coming up so I kept my eye out for something for Susan. Well, I was hard pressed to find anything. At one store on my last day there I found some cards, and when I say some I mean about four different ones to choose from. This may be hard to believe, but it sure makes the choice as to what card to get easier. I didn’t, however, find any chocolates but I figured the store here in Ukarumpa would have something. When I returned I was still out of luck because the store had no Valentines chocolates, but luckily I had bought something for Susan that she had really wanted since we had come to PNG. An electric hand mixer! Now I can just see the faces of you women now. You bought her a kitchen appliance! Do you know anything about romance?! In my defense, you should know that here in PNG pretty much all our meals are home made from scratch and Susan likes to make a lot of things that require mixing. So to her it was a wonderful gift and something that will make her life easier. Not to mention it will keep the good meals coming for me! But back to the chocolate. While I was gone Susan came up with the idea to make chocolate truffles to sell to the other people living here in Ukarumpa for a nice gift option for Valentines Day. 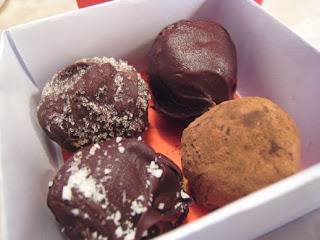 So earlier this week she went into full swing making four types of truffles – mint, almond, mocha, and cookie dough. Now I can’t say that I tried them all but the two that she let me try were pretty good. She ended up selling most of them and it was the closest thing to a box of chocolates that I had seen here yet. So since she was making chocolates she really didn’t want me to get her any anyway. Which is nice for me and we still got to have chocolates for Valentines Day. 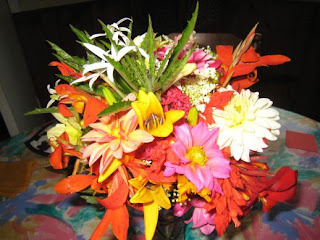 Oh and I did get her a bouquet of flowers at the market on Friday too. I support you in your gift purchase Brian. I think it was very thoughtful of you. At least you didn't get her a handsaw or something like that. Nice to finally see the Dahlias! Glad Susan got something nice for V. Day.